The Pocket Theater opened its four week run of Saturday Morning Cartoons Saturday April 18th. With the tag line “Short plays inspired by ‘Toons written by families, for families”, it doesn’t disappoint. With the playful atmosphere, children chattering and laughing, you are smiling before the show even begins. Directed by Steven Sterne, the ensemble generates laughter from beginning to end. With skits that include parodies of Scooby Do, Speed Racer, and Ghost Busters, adults are drawn into the show with classic cartoons we grew up with. While a few skits are bit more obscure and reminiscent of Toy Story, and The Powder Puff Girls, the others are just as hilarious and entertaining for children and adults alike. I couldn’t help but feel like I was watching a Pixar production- hidden meanings and innuendos that go right over the kids heads, but with childish humor that involves jokes and silly puns like “Scooby Doo Doo”. Also the pop culture references of Frozen, kept the kids involved with current cartoons. 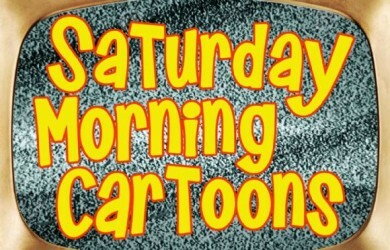 In true Saturday morning cartoon tradition, old school cereal commercial jingles played between the skits. The hilarious cast, writing, props, and sets make for an enjoyable Saturday morning with the family.